Watch the BMW 6-Series Cabriolet transform into a Soviet Pobeda right before your very eyes. 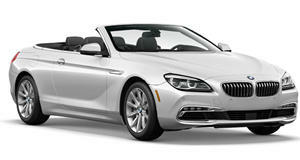 The BMW 6-Series Cabriolet is a classy and attractive car that exhibits some of the best qualities of German engineering. The Soviet-era Pobeda from Russia (1946-1958) is a soul-less harbinger of communism and the drabness that defined Cold War-era Russian society. When you combine the two, well, let&apos;s say that the results are actually pretty impressive... unless it all falls apart after, say, 200 miles. Plucked from EnglishRussia.com comes several photos of a crew of Russians transforming the BMW 6-Series into a vat of a car as well-known in Russia as Borscht, the Pobeda. Apparently it isn&apos;t uncommon for Russians to transform their old Soviet cars and older foreign imports into new versions of different cars, however this one has to take the cake. The newly remodeled car is now called the Volga GAZ M-21. Check out the photos and build process of a car turned Soviet classic and let us know what you think about the extensive build-job.